It’s January 30th and that means I made it to day 30 of this Whole30. Well, technically I did cheat one day, so it’s not an official Whole30, but since this is my third(ish) time through, I think it counts. So in the words of Vicki Gunvalsen, Wooooohooooo! I haven’t updated here for awhile because, well, things have been pretty routine. Cook, sweat, shop, sleep, repeat. We’ve been using our dehydrator a lot for fruit, which I think has saved us some grocery money. However, I’ve yet to find a good shopping routine. 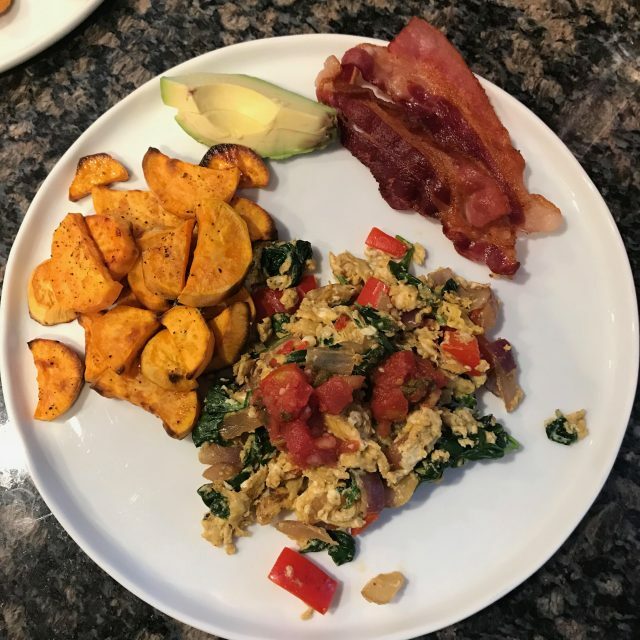 We plan to stick with this Whole30 way of eating for the foreseeable future (while allowing a cheat meal or drink once every two weeks) so I’m still eager to fine tune the shopping and spending. I was spoiled in California. Within 5 miles of our house we had several big chain supermarkets, two Trader Joe’s, two Whole Foods, a Sprouts and, my personal favorite, Whole365. I even went to Whole365 when we visited last November, for old time’s sake. Here, I have to drive about 20 minutes for Trader Joe’s and a little longer for Whole Foods. I can certainly find enough of what we like at the in-town supermarkets and the couple small, natural food stores. But the mark-up is all over the place. And don’t get me started on how hard it is to find a good avocado. The good news is that’s forced me to try a few new recipes. On Monday I made this beanless chili recipe in the InstantPot and it came out great. On reheating, the sweet potatoes fell apart, but that didn’t affect the taste. I used ground beef instead of turkey and I doubled the Rotel. I also didn’t measure the spices because I like to live dangerously. I’ll definitely be making it again! 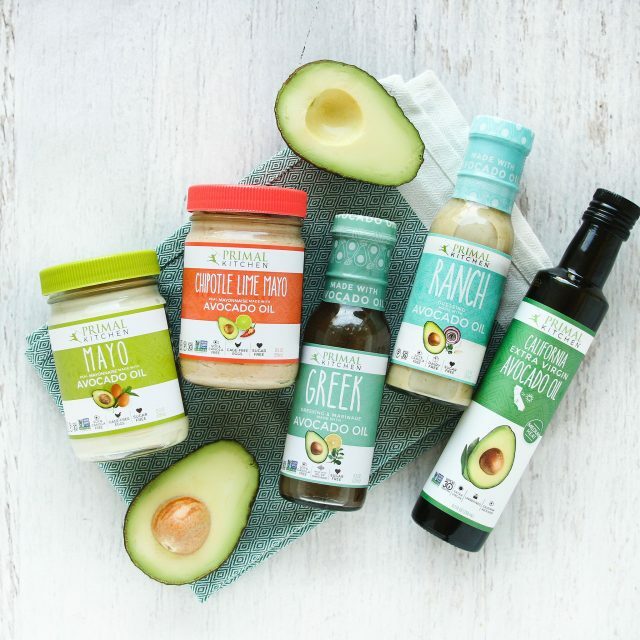 Pretty much the only thing I need to go to Whole Foods for is compliant dressings and mayo (yet somehow I always seem to spend $140 there…) so I think I finally have the kick in the pants I need to start making my own. Biff has been kicking around the idea of making another batch of Kombucha, but I’m ok with not having a living yeast culture on our counter. So I’m off to workout and then to the grocery store today! Tomorrow I’ll weigh myself and maybe I’ll have a gluten-free cider to celebrate. And then, it’s right back into another Whole30! Holy moly- day 20 already? Time is flying and things have been busy- as evidenced by my little delay in posting! We got some snow overnight; it’s the first significant snowfall we’ve had since we moved here so I used my free time making mildly panicked grocery runs this week. And wouldn’t ya know it, I still didn’t have enough ghee and we’re already down to two kombuchas?! On Thursday, I had a physical with my new doctor here in town. I know I’ve mentioned it before, but during a round of the Whole30, you’re not supposed to weigh yourself. But since I didn’t weigh myself to start with, I rationalized that I wouldn’t get discouraged by learning my weight at this juncture. So I weighed myself before I went and it was about what I thought. But somehow, just an hour later with nothing additional to eat, and the lightest clothing I could get away with, I was 7 pounds heavier on that damn doctor’s office scale. Never fails. What is that? Maybe it’s time to stop using the stupid sliding thingy. I was also a good inch shorter than what my driver’s license says. Rigged. Otherwise, the check-up went pretty well. I have to do some bloodwork still so I’m not 100% sure I’m not dying, but it’s looking that way. 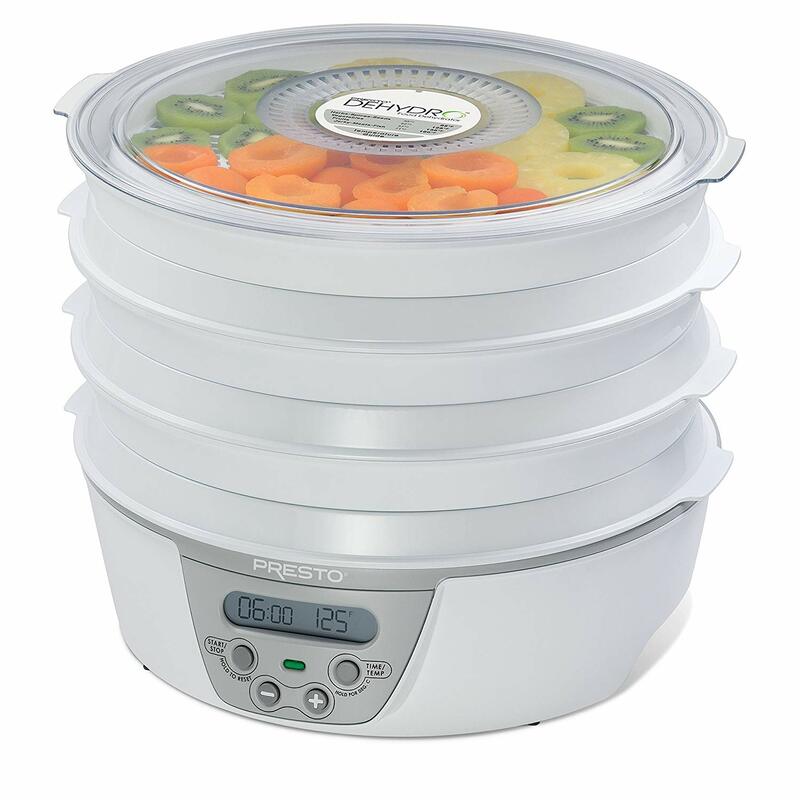 We also got a new, Whole30-related kitchen gadget this week: a dehydrator. One of the few “treats” we allow ourselves is dried fruit. It’s really hard to find without added sugar, and it’s stupidly expensive for what it is. So we took matters into our own hands! We dried out some pears, bananas, mangoes and apples so far. They all turned out great except we should have pealed the mangoes first because the skin was a little tough. And then today, I’ve just been fighting the temptation to hunker down with some wine while watching the Patriot’s game. Does Tom Brady drink wine? I peg him as a Chablis kind of guy. I was also tempted to finish my son’s hot chocolate (he ate the whipped cream off and then declared he was full) while watching the neighbor’s snow-blow, but ultimately, I stayed strong! I added a few new dishes to the rotation this week, too. I got a suspiciously good deal on some pork chops, so I cooked those in a pan on the stove top and then deglazed the pan with the leftover marinade, some garlic and onions. I poured that over the chops, mashed potatoes and asparagus. Now I think I’m an expert in deglazing. I did a similar technique with steak tips the next night. Who knows what I will deglaze next! So just ten days to go on this round (not counting my transgressions last weekend). Right now, we’re planning to take a day or two off and then probably get back on another round. Or, at least, do two weeks on, have one day off, and then two weeks on, one day off, and so on. I think we could really do that for a long time. Feeling good feels good! I think the success of any diet depends on how well you can adapt it to different situations: dining out, parties, traveling, etc. This weekend was a huge test of that. And, well, I made a choice to go a little off plan, in the name of hanging out with some of the best friends a gal can have. So technically, I’m starting over on my Whole30, but I’m not bumming. I never really looked at this as something I was only going to do for 30 days, but rather a way of eating *most* of the time. Back in the day, before Biff and I got married, we had a lot of success doing a certain “life-style change” that let’s just say rhymes with Beight Batchers. We would track our points diligently, but every other Sunday, we’d go out to eat and indulge a little for just that one meal. We both have discussed approaching our new eating habits the same way. Friday, I met up with some of my favorite friends from childhood. I chose a steak with asparagus for my dinner, which was probably pretty close to compliant (I didn’t ask about the cooking oil for the steak, that’s probably the only thing that might have been on the banned list) but as we were getting into some juicy gossip, I had a gluten-free cider. Or two. Then Saturday, one of our bestie couple friends came over to see our new house. Let’s just say, we had some snacks. And then Sunday, my mom came over and we had brunch out. Though aside from cheese, that meal was pretty compliant. Oh and a cider. Or two. D’oh! So here we are! You know, it’s kind of nice having the knowledge to make the decision to indulge. And it’s especially nice to understand that a few “off” meals doesn’t mean I have to totally throw in the towel completely. It’s so much more meaningful to enjoy good food with good people on a special occasion. I think that’s called maturity? I can’t be sure. I did make some yummy compliant dishes in that time too, though! One of my easiest go-to meals is a meat marinara sauce with zoodles. 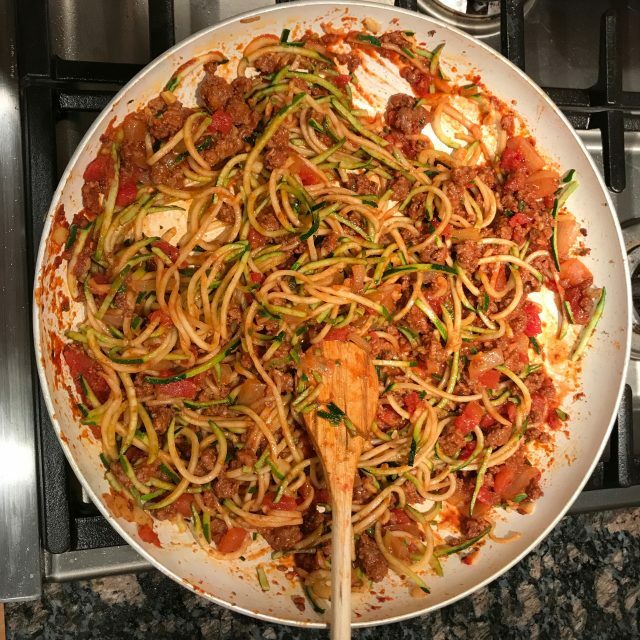 I don’t really have a recipe I follow, I just cook up some ground beef with garlic and onions, add some canned tomatoes and tomato paste, and then toss in some pre-spiralized zucchini noodles toward the end. Tonight I followed just the portion of this recipe which pertains to making brisket in the Instant Pot. It came out really good! Just beware of the ingredients in the beef stock, it can be really hard to find one that doesn’t include sugar. I roasted some asparagus and added some pre-riced veggies and then poured some of the leftover liquid from the Instant Pot over everything. Boom! Brisket in the Instant Pot. Say what?! I was feeling kind of crummy today, I think it may have been a mini-detox from the weekend festivities. So I skipped my workout but I’ll go tomorrow instead to make up for it. Unless the workout is 1000 burpees. Then I will not go. Later this week, I have a physical with my new doctor. I’m hoping she’s blown away by my low blood pressure and shiny, silky hair. We’ll see! We’re on Day 10 of this Whole30 and things are still chugging right along smoothly. Maybe even better than smooth– I went to see my esthetician today and when she came out to greet me she immediately asked if I’d lost weight. Ooooooo girl. I last saw her in mid-December so since before we started this round. I’m pretty sure she wasn’t just saying it to get a good tip. She’s also does my hair removal and I’m half Greek, so she understands I need her more than she needs me. One of the rules in the Whole30 is not to weigh yourself during the 30 days. You can weigh before, and after, but the idea is you don’t want to get discouraged by normal fluctuations. I actually didn’t weigh myself at the start of this round, so I’ll be going off of how clothes fit to figure out if I’ve lost weight. And so far, I think things are starting to feel a little looser. When I went for my appointment today, I was wearing leggings as pants (normally I reserve that for the privacy of my own home, or when I’m ensconced in a giant winter coat) which could have been what my gal was reacting to. It is quite a sight to behold. Chicken Thigh Stir Fry. Taste the Rainbow! Cooking has been going well too. I’ve enjoyed finding some new ways to use things like chicken thighs and pork loin. 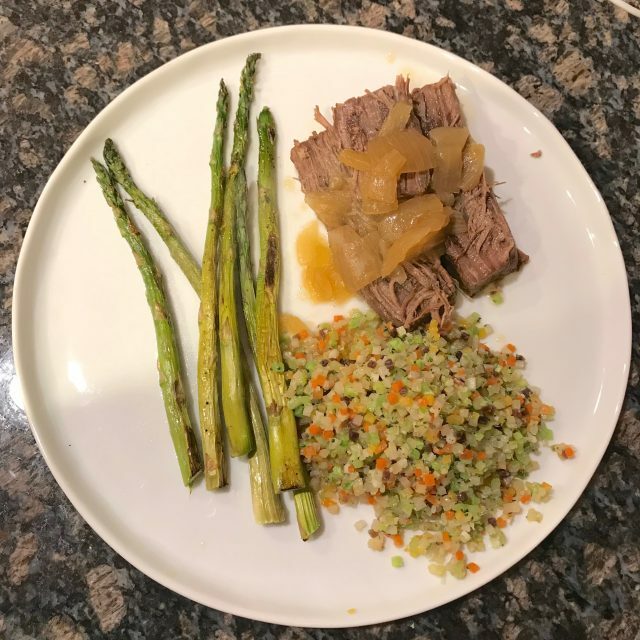 This week, I made the pork in my InstantPot and treated it like pulled pork. I used this recipe but adapted it to the InstantPot by adding a half cup of water and cooking on manual for 90 minutes. It came out great and it makes at least 6 servings. Last night, I cooked up the rest of the chicken thighs. First I marinated the chicken in Coconut Aminos (which is often used as a sub for soy sauce on the Whole30 because soy is not allowed) and some minced garlic. Then I sliced it up and cooked it on the stove top. I added in a Kale/Brussels sprout stir-fry mix and some riced veggies. I added some more coconut aminos during the cooking and a dash of rice vinegar. It looked great and tasted good too. Winner winner, chicken dinner indeed. I’m eager to start seeing some progress at CrossFit. At my gym, you pay by the number of weekly classes you attend. Right now, I’m on a 3 day/week plan so I make sure I go Monday, Wednesday and Friday. I might see if I can add a day because I often find myself wanting to go more. At my gym California, you could go as much as you wanted so I was averaging about 5 days a week. That was probably a little too much, but I saw a lot of progress on some specific skills that we did a lot. Then again, I wasn’t as busy getting facials and pretending to be intimately familiar with the KonMari technique of “Tidying Up.” I spend a lot more time these days thanking my belongings and thinking about throwing them in the trash. Tomorrow is dinner with some gal pals and I’m really looking forward to it. Will I give in and have a glass of cider or wine? Will I go on a queso bender and resurface next week in a Western Massachusetts dumpster? Check back here this weekend! Or if you have a WordPress account, you can follow me and it will update you when I get around to making a new post. Arigatou gozaimasu! Whole30-ers call this burst of energy following the detox hump “Tiger Blood.” It usually happens a little bit later– maybe like day 10 or 11– for most people. But we seem to be on the Whole30 express train on this round. I slept like a rock last night, despite gale-force winds. Normally, I would lay awake, waiting for the chimney to collapse or for a tree to fall on my car. But last night, I only pondered my imminent death for like 5 minutes before falling asleep. Winning. Yesterday, we visited the winter farmer’s market in our lil’ city. We got some great root veggies which Biff roasted for dinner along with chicken thighs marinated in Primal Kitchen’s Green Goddess Dressing. We also picked up some locally made chorizo which seems to be compliant, perhaps we’ll have that tonight! Ole! The guy selling it was very helpful. When we asked if some kinds of sausage had sugar he said “Yeah, but just a little.” A little is too much for the Bouses! I think one of the greatest benefits of this diet is the awareness about how much sugar is in everything– even if it’s just “a little.” The Whole30 is strict about sugar. You can’t have anything with added sugar/sweetener at all. Even if it’s honey or maple syrup. But fruit is allowed, and using fruit juice is ok as long as it’s in a recipe or just a splash in some soda water (basically, you can’t guzzle a glass of OJ). Sour Patch Kids are out. Free-basing Stevia is a thing of the past. No more Vodka-Crans. So it’s nearly lunch time and I’m contemplating what to make. We really enjoy these Chicken-Lime Burgers from Trader Joe’s. They cook up fast and go well with a bunch of sides. You will need a chisel to break them apart when frozen, but it’s oh-so-worth it. I usually treat it like a bun-less burger and serve it on spinach with mayo, mustard, and whatever veggies I have handy. In the timeless words of Rachel Ray, Yum-o! Is That Fog or Shade? It’s Day 5 of 30 here at the ol’ Bouse House and so far…so good. This time around seems to be a little less physically taxing, though we do have a couple of the usual first week ailments. Biff has had a dull headache the last couple of days and I’ve been a little foggy. Not necessarily tired, but just not as sharp, I’d say. I got sucked into watching a Taylor Swift concert on Netflix with my son yesterday. I found myself getting annoyed at her repeating the same three dance moves (and yes, I’m counting hair scrunching as one of them) yet I was too numb to look away. Maybe it’s the sugar detoxing, maybe it’s just the power of T. Swift. The world may never know. I did CrossFit yesterday for the second time since starting this Whole30 round. I made sure to tell the people around me that I was feeling foggy, so they wouldn’t be alarmed if they saw me staring at a pile of weights, confused. I did ok in the workout, but it called for handstand push-ups. As the name implies, you do a handstand against the wall, lower yourself so your head is touching the ground, and push yourself back up again. I can’t do them fully, (mostly due to being scared of crushing my skull) but I can usually manage 5-6 in a row if I put a couple of mats between my head and the floor. This time, it was all I could do to just get into a handstand. Plus the shirt I wore kept coming untucked. It was a scene. The good news is, I’m already starting to feel some of the positive physical changes, too. I feel less bloated. I wore my jeggings comfortably to Target yesterday (when I die, please someone have them put “Wore Jeggings to Target” on my gravestone.) My skin is looking milky white like one of them Downton Abbey chicks. And I seem to be sleeping more soundly. We’ve been eating much of the same for breakfast– eggs and potatoes. Lunch has been salads mostly. I made a nice meatloaf with mashed potatoes and brussel sprouts a few nights ago, and tonight I’m contemplating what to do with a package of chicken thighs. 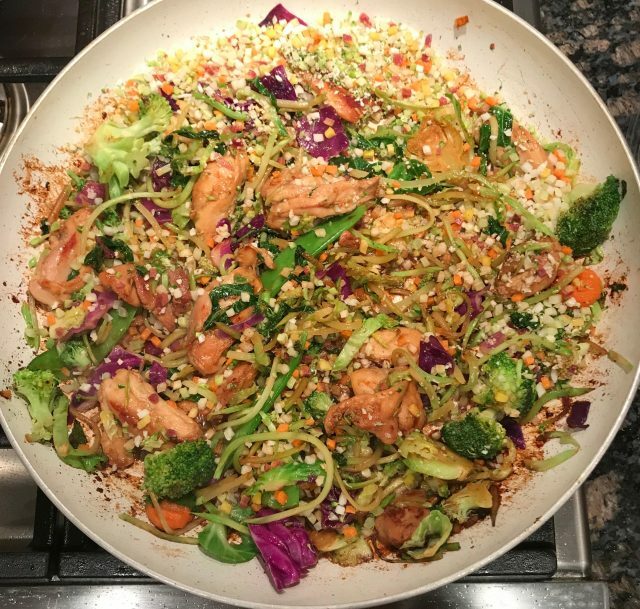 I’m thinking of using some coconut aminos to make a stir-fry, served over cauliflower rice. If I had a dime for every time I was confused with Oprah, I’d have, roughly, a couple of dimes. At the risk of furthering the confusion, I thought I’d share some of my favorite things! 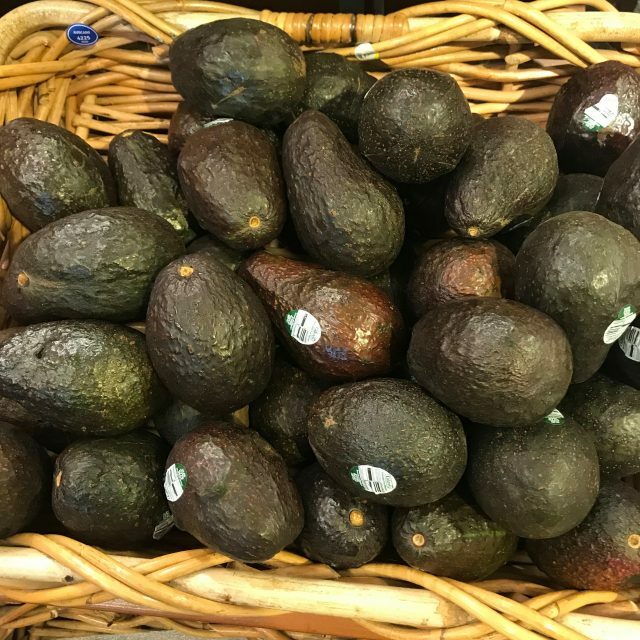 It looks like I have a few friends starting or contemplating the Whole30, and these are some items and tips that I think can help. You probably have a favorite pan already. I bet you even have a favorite burner on the stove. Who knew life could be this thrilling!? The Whole30 requires a lot of cooking, and if that’s a change for you, consider investing in a decent pan that’s super easy to clean. When we started our Whole30 last year, we got this one and this one from Target. They pretty much stay out all the time. 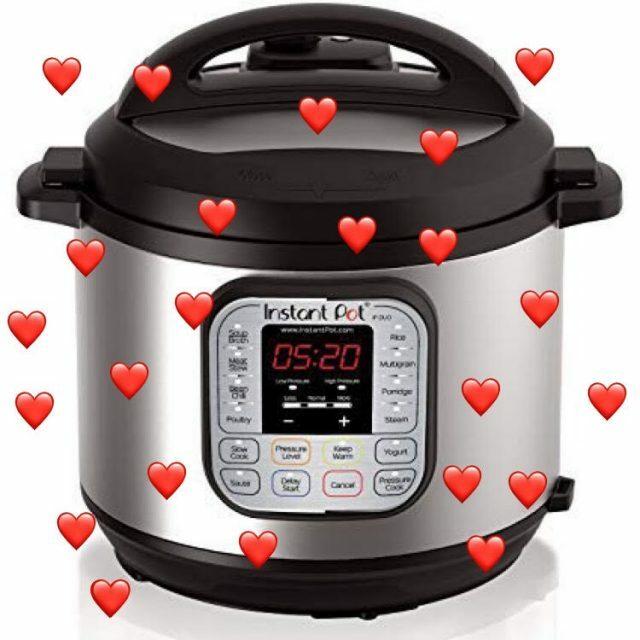 I didn’t have an Instant Pot until recently, and I’m looking forward to using it this Whole30 round! It’s really great for making hard boiled eggs (among many other things). I don’t know what I do wrong when I make them on the stovetop, but my kitchen looks like a crime scene after I’m done trying to peel them. A dozen hard-boiled eggs will yield like one edible egg. But not with the Instant Pot! They peel super easily. I used to be someone who didn’t like eating the same things all the time- until I started actually making breakfast. 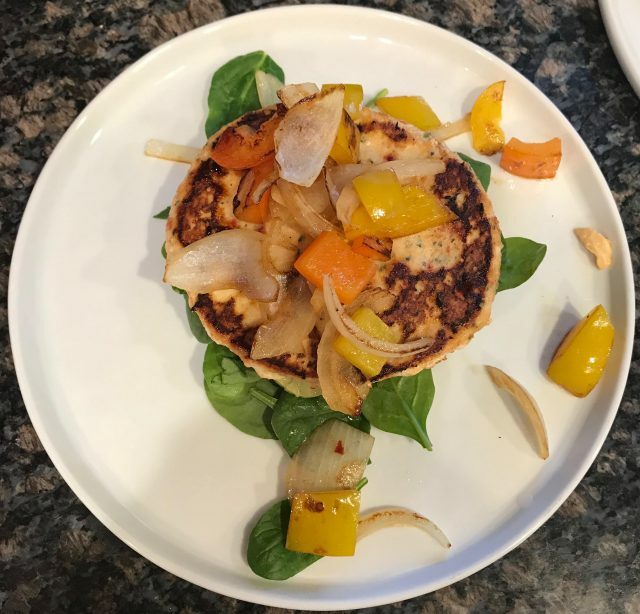 With all the time and energy that can go into cooking daily for the Whole30, I like being able to do at least one meal on autopilot. Breakfast is generally: roasted potatoes, two eggs scrambled with onions, peppers and spinach, bacon or avocado. Sometimes I’ll use a dab of mayo as the healthy fat. I bet I made some variation of this breakfast 300 times last year. Trader Joe’s has a fun little selection of seasonings, and this one is my favorite. Add it to some sweet potatoes and it’s like the G-8 Summit of taste buds. I’m not really sure what that means. But it’s good! Sure. You can make your own compliant dressings and mayo. But what is this, Puritan-times New England? You can find these at Whole Foods or order online. I’ve seen a couple of their products in regular grocery stores too, sometimes they’ll put them with the “exotic” health foods. They’re not cheap, but for me, the time and effort they save is worth it. I keep saying I’ll attempt to make my own mayo, but let’s be real. That’s as likely as Kate ever getting along with her third stew on Below Deck. It’s alive! Kombucha can be an acquired taste, but I think GT’s does a pretty good job of cutting the sourness with some nice flavors. Kombucha is one of the few “fun” drinks allowed on the Whole30. A lot of kombucha brands will add sugar after the fermentation, which of course, is a no no. GT’s is compliant however. I like the Cosmic Cranberry the best. Biff and I will usually each have a ‘buch in the evening while we watch murder shows on Nexflix and eat dried mango. Is this what the kids mean when they say “Netflix and chill?” Cuz it’s definitely lit. So those are a few of my expert tips and picks. Impressed? As always, be sure to read labels! I’m seeing a lot more products this time around that are stamped with the Whole30 logo, which is very helpful. I hear there are even some microwavable meals you can get at WalMart now (I don’t have a microwave and I hate going to WalMart so don’t count on seeing a review of those products from this gal!) Now…how do I get these companies to pay me for my incredible endorsements…?